LAUREL CANYON—Now that it’s practically dark before tea time, it’s a chance to look up into the sky. Lucky for us here in the canyons our view of the night sky is pretty good. Another one of those things that we forget to notice. Lately the crimson and tangerine sunsets with promises of rain tomorrow, have me looking up hunting for the first star of the night to appear in the southwest sky at about 60 degrees from the horizon. North Star I ask myself? That’s the brightest star in the sky, right? Not this time because I was sure north was the other way. We’ve all been drilled with “planets are brighter than stars.” Well, it’s the planet Venus. I will never be an astronaut, celestial navigation has me stymied. I’d need to stop at a refueling planet and ask directions. My curiosity was also drawn to the sunset crimson in the north, and tangerine in the south? Different colors on the same nights. What’s the deal? The colors are just breathtaking. How does Mother Nature do it? The artists who live in the canyons know that colors are all a refraction of light, which put me on the hunt for an explanation. After much fidgeting and figuring I think I’ve made sense of this beautiful phenomenon. Stay with me on this one. The light that paints the horizon at dusk travels a longer path to reach us as the sun moves toward the horizon. What colors we see are determined by the distance coupled with the dust and clouds in the atmosphere which bend the usual straight beam of light, turning the skies into hues of red and orange. So how is it that from the hills the sky over the city is tangerine, while the sky over the Valley is crimson? The science of sunsets explains that as light travels through more particles in the sky, we are seeing the light through the atmosphere which has tiny particles suspended in it called aerosols. No not the straight up pollution that comes to mind, the stuff that occurs in nature without out help, like the soil; salt from the ocean; plants; vegetation or yes, the burning of fossil fuel. So the aerosols bend the short light beams which are on the blue end of the rainbow, allowing only the longest red light rays to be visible to us. 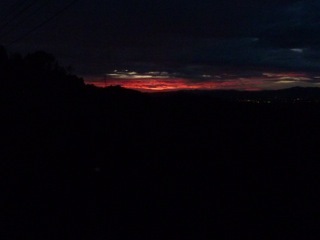 The vista over the San Fernando Valley is crimson. Hmm, you’d think the city pollution (aerosols) would make the sky over the city red. After all red is the longest light wave, which is better able to navigate through the aerosols in the atmosphere. But wait! The Valley’s sunset is effected by the salt particles dispersed to the air from the ocean! Okay, so at best I have a tenuous grip on this business of sunsets. Thankfully some things I am just content to enjoy. And it’s not likely that I will ever have to ask for directions to Venus. Previous articleTab Hunter, Gay, Happy And At Peace!